#IIIT RGUKT Integrated B.Tech Program Admission 2017 Notifications for AP Telangana: After schooling, general pattern is that intermediate, EAMCET exam and then according to our rank we can opt seat in the course B.Tech in any college that we are interested. But now we have integrated courses of B.Tech that which are familiar those are none other than IIIT. Here we do not have any entrance test, but after our tenth result according to the merit list of the applied candidates admissions will be held. Under RJUKT university,notification for admissions in the courses of 6 years integrated courses is released. Notifications are released by Vice chancellor of RJUKT separately for Telangana IIIT Basara & Nujiveedu, Edupulapaya IIITs. Each IIIT consists of 1000 seats and total of 3000 are going to be filled. Tenth passed candidates may apply and their GPA is considered for the admissions. Those who studied in govt, ZP, Municipal schools 0.4 GPA will be added more for them. In the wake of the bifurcation of erstwhile Andhra Pradesh State, the admissions to the RGUKT in both Telangana and Andhra Pradesh would be made as per Article 371 D i.e., 85% seats will be reserved for the locals and 15% of seats would be open to both the states. So, In Basara campus IIIT admissions will be according to 371D i.e.,85% of seats are reserved for TS students only and rest of 15%are for open category both Telangana and Andhra Pradesh students can have the choice for admissions according to the merit list. Similarly, Nuzvid and Idupulapaya campuses in Andhra Pradesh admissions will be according to 371% 85% of seats are reserved for AP students only and rest of 15%are for open category both states students can have the choice for admissions according to the merit list. Both state's students should apply through online only. 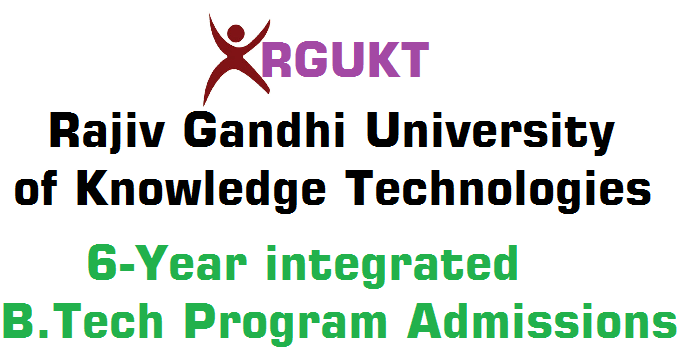 The RGUKT offers six year integrated BTech courses in Electrical and Communication, Chemical Engineering, Civil Engineering, Mechanical, Computer Science Engineering and Metallurgical and Material Engineering. The application fee for General, BC students is 150/-, SC, ST students is 100/- only. Registration fee, annual fee details will be available in RJUKT website. Guide lines for fee reimbursement will be given separately. The interested candidates should beware of English, do not feel stress, develop your skills like communication, personality development, soft skills.Be prepared mentally and physically. In this prestigious institutions, discipline is very important. So become mentally strong and fit. Keep in mind that "TO GAIN SOMETHING LOOSE SOMETHING".